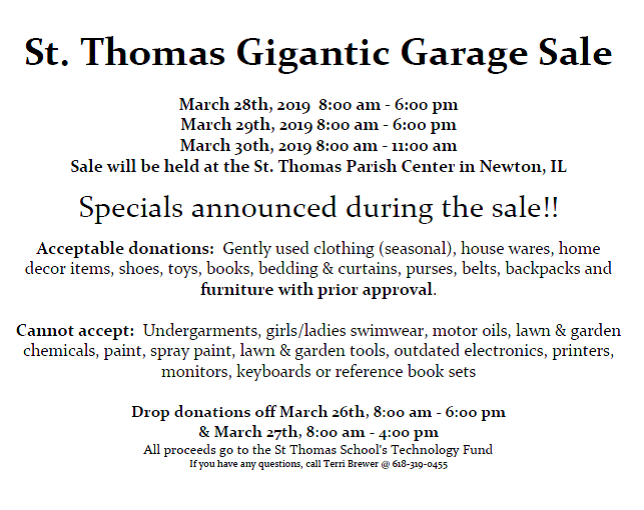 The Spring 2019 Gigantic Garage Sale will be held March 28-30, 2019. St. Thomas holds its Gigantic Garage Sale twice yearly - spring and fall. The proceeds of the sale support the school's technology fund. You'll always find lots of quality merchandise - clothing, books, kitchen gadgets, what-have-you - at good prices. Check us out, and you won't be disappointed. Thank you to everyone who helped with - or shopped at - this spring's garage sale. Your help makes it all possible.